This time of year is when everyone starts to look for comforting, hearty recipes to warm themselves from the inside out. Like today for instance. It’s cold. The wind has been howling for two days now. And the last thing I want on my dinner plate is a salad. No ma’am, I want something substantial. Something that will stick with me for a while. 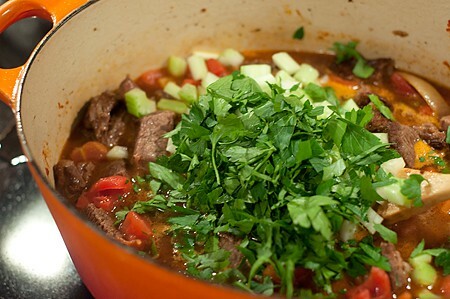 Something like this Garlicky Beef Stew. You could purchase stew meat for this recipe, but I just used an inexpensive chuck roast that I cut into cubes myself. If using a roast, cut it into about 1-inch pieces, then pat it dry and sprinkle with salt and pepper. In a heavy bottomed pan heat the olive oil over medium heat. When the oil is hot, add the chuck in batches and cook until browned on all sides. Do not crowd the pan and add additional oil with each new batch if needed. Remove the browned meat to a plate and set it aside. While the meat is browning, prepare the onions and garlic. Peel the onions and slice them into rounds. Peel the garlic. Add the butter to the pan. Add the onions and garlic and sprinkle generously with salt and pepper. Cook, stirring occasionally, until the onions have begun to wilt and brown. Stir the tomato paste into the onions and garlic. Cook the tomato paste for just a minute or two and then add the beef stock, diced tomatoes with their juice, diced celery, and fresh parsley. Stir together. Bring to a boil, then reduce the heat to a simmer. 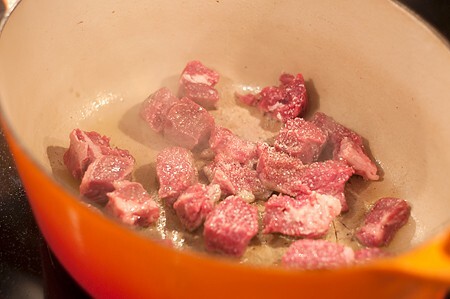 Cover and cook over a low simmer for about 2 to 2 1/2 hours or until the beef is very tender. Serve over brown or white rice, noodles, or mashed potatoes. Sprinkle with additional fresh parsley for garnish. A very garlicky beef stew. Great Halloween dinner - keeps the vampires away! 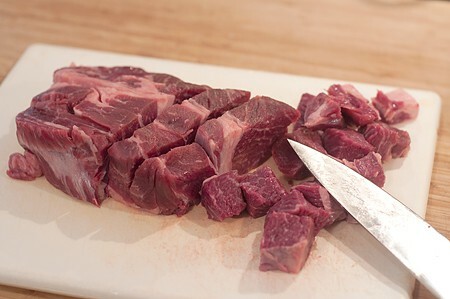 Cut the chuck roast into about 1-inch pieces. Pat dry and sprinkle with salt and pepper. In a heavy bottomed pan heat the olive oil over medium heat. When the oil is hot, add the chuck in batches and cook until browned on all sides. Do not crowd the pan. Add additional oil with each new batch if needed. Remove browned meat to a plate and set aside. 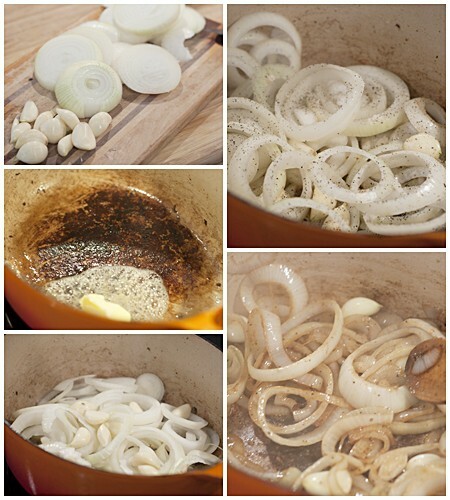 While the meat is browning, prepare the onions and garlic. Peel the onions and slice into rounds. Peel the garlic. Add the butter to the pan. Add the onions and garlic and sprinkle generously with salt and pepper. Cook, stirring occasionally, until the onions have begun to wilt and brown. Add the tomato paste and stir it into the onions and garlic. Cook the tomato paste for just a minute or two and then add the beef stock, diced tomatoes with their juice, diced celery, and fresh parsley. 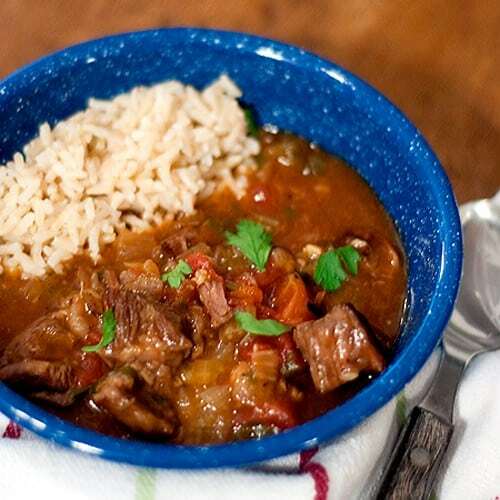 I absolutely LOVE beef stew! Robin has a go to recipe she got from Emeril, but I like your use of Garlic. I LOVE Garlic! I’ll have to make this, and pair it with some wines on A Good Time With Wine! Thanks, Matt. If you’re a garlic lover, then this stew is definitely for you! No worries either about an after taste since the garlic literally melts into the stew and becomes very mild and sweet. I’d be very interested in seeing what wine you pair with this recipe. Looks great. Love the pot. I love that pot, too! Use it all the time. So glad they liked it! And by the way, it’s even better the next day. What a great way to change up stew. We’re garlic lovers at our house.